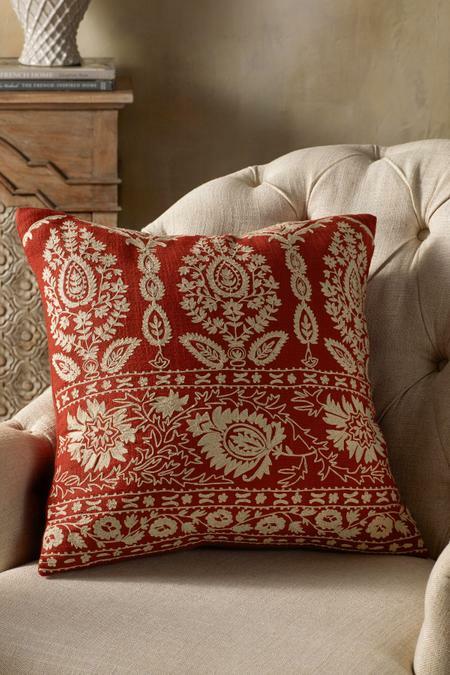 The beauty, the details, and the exquisite hand embroidery set this gorgeous pillow apart, with lavish floral medallions and leaf-inspired accents on soft, slub cotton. Expertly handcrafted for us by artisans in India, the cream embroidery against the canyon-red fabric is reminiscent of a vintage textile our designers were excited to discover in India. Hand embroidered on soft 100% cotton. Solid embroidered on the backside.